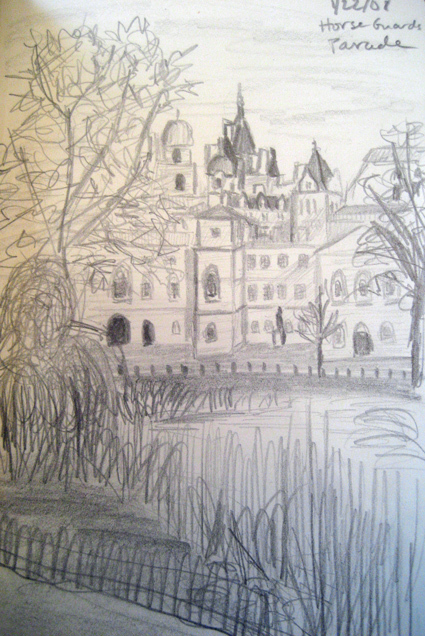 To make up for my terribly inaccurate drawing of Horse Guards Parade from St. James Lake, I went back on Tuesday and drew it for real. From my spot, I couldn’t see the whole thing, and it was partially obscured by trees. And I also had a lot of people walking in front of me and stopping to take pictures of various attractions and feed the birds (though none so dramatically as on my last trip to the park), which was a bit frustrating. I also think I need to buy a new pencil sharpener. Mine seems to have stopped working. In any case, enough with the excuses. Here is the much more accurate drawing, though it could still use some work. And definitely the touch of a better-sharpened pencil. Oh, and it was cold when I was drawing, too.